After being briefed on the safety issues, the tour is mostly guided by military expert, ME-3 Lau who introduced the different segments and utilities. 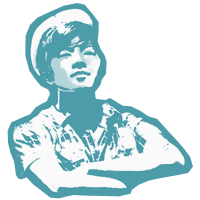 His detailed explanations and kind patience is definitely something to be commended for. 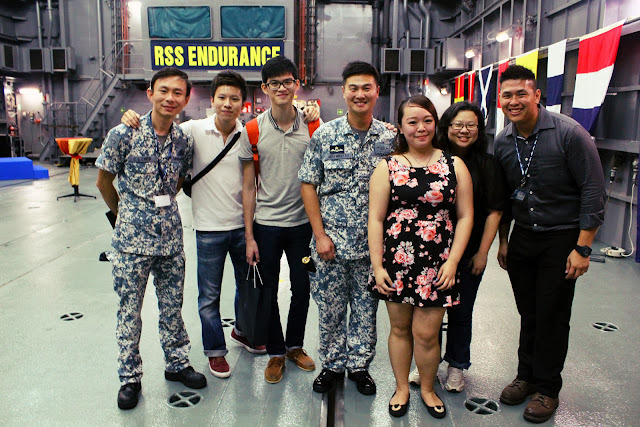 Beside him, we are honoured to have the company of Kee Onn, ME-2 Wisley, CPT Tang, as well as LTC Chew. In the midst, we even acquired several naval terminology, such as heads (toilet), galley (kitchen) and starboard ectera. My favourite area is definitely the Bridge, also known as the command center in layman's term. This place is where the main actions take place! 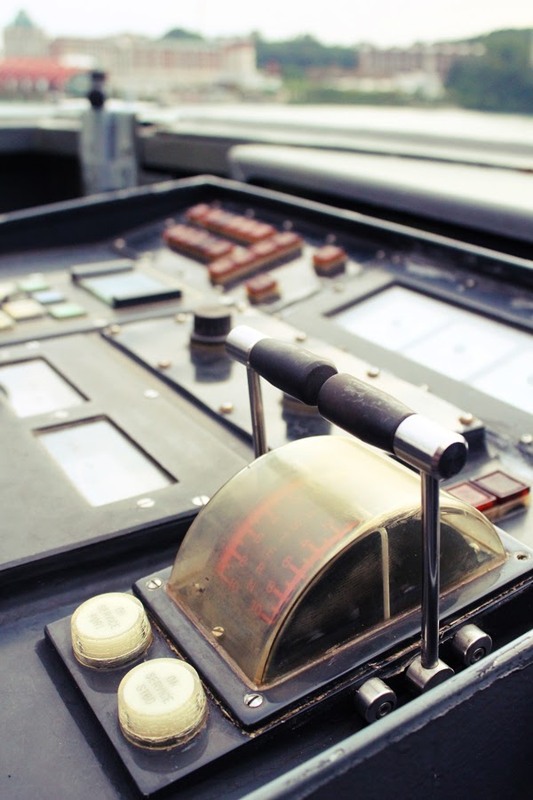 Just like a control room, the room is filled with numerous buttons, levers and cool gadgets, such as their compasses and other navigation tools. 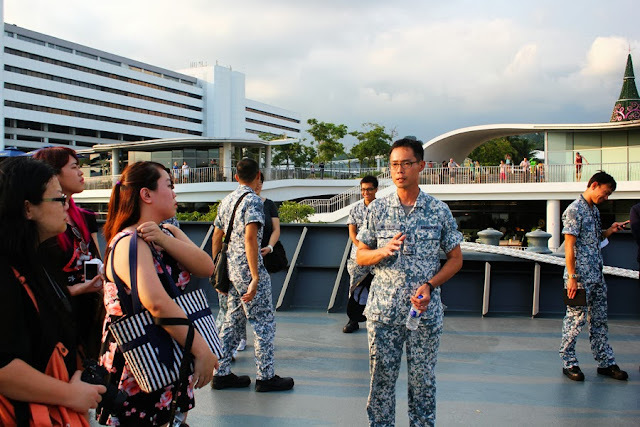 Here, we have CPT Tang showing fellow blogger, Michelle, who seemed to be very fascinated with one of the compasses. 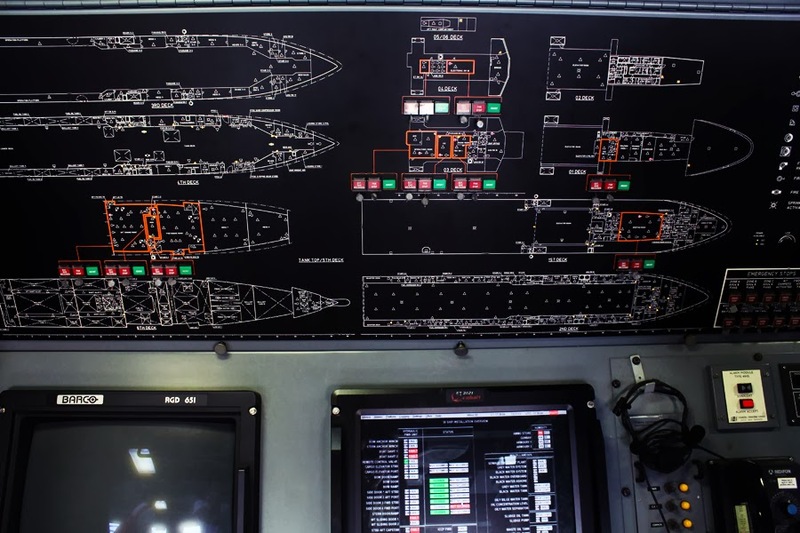 The things that you see in movies: a blueprint of the whole ship, amongst other control panels. The fully integrated bridge console includes dynamic control systems, a ship control monitoring and management system, electronic chart display information system, surveillance radar and navigation radar. 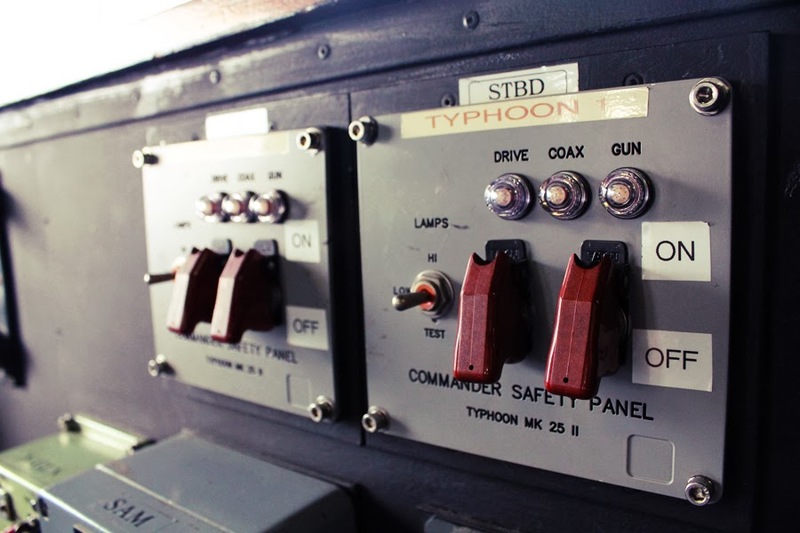 And probably this: a commander safety panel which acts as a safety catch for the ship weaponries. And whatever this cool looking control board is. Transiting from storey to another level is never easy for a naval neophyte, the steep stairs and low ceilings are similar to obstacle course for most of us, including myself. Now you know why most navy personnel are kept fit, they have to manoeuvre these on a daily basis. 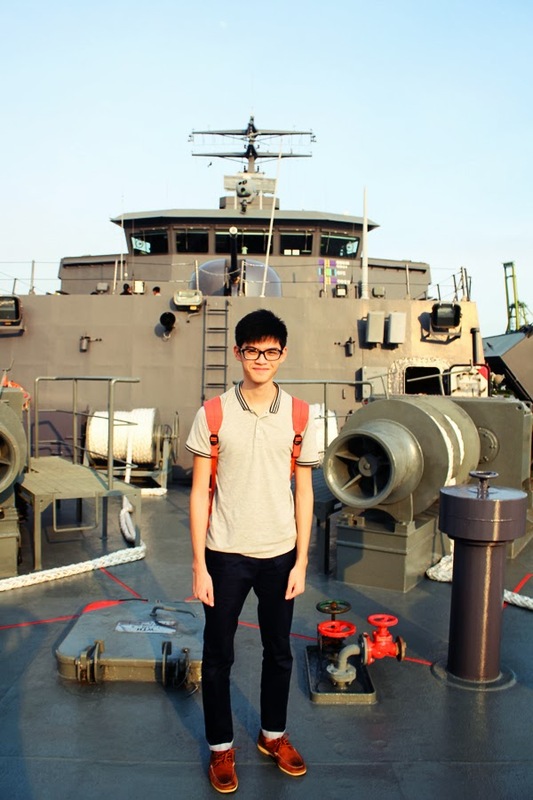 For tall people like my bestie, Wai Yuen who clocks a height of approximately 1.8m, it was another story (and luckily he was a land soldier). At a single point of time, RSS Endurance is capable in housing a number of tanks and 5-tonners, amongst other vehicles, bulk cargo, and two helicopters on its flight deck. Boats and landing craft carried include four 13m fast craft equipment and utility (FCEU) and two 25m fast craft utility (FCU) vessels. 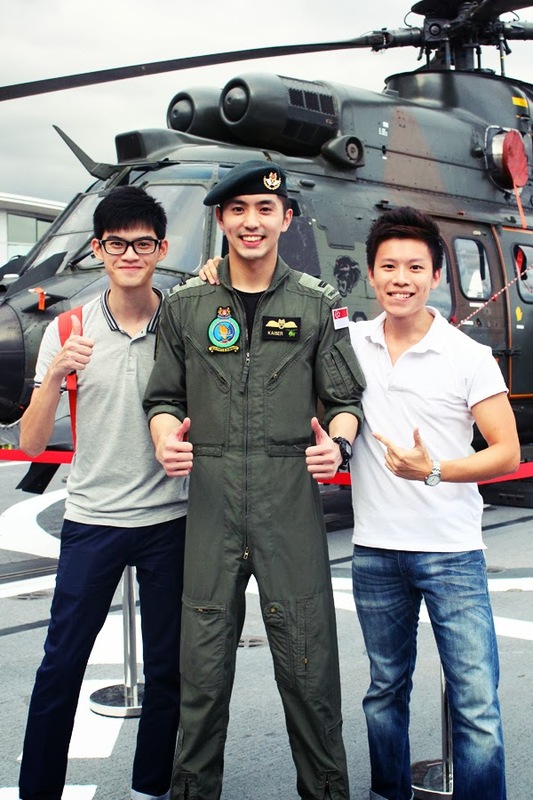 Here's us with LTA Kaiser, pilot of the beautiful helicopter parked behind. I regretted that I did not take photos of the sumptuous buffet spread prepared by the naval chefs, as most dishes were already served on the tables before we made it to the dining area. Nevertheless, I would like to praise them for their high quality and standards of preparing, crafting and presenting the dishes. These chefs, who might have to carry out a range of duties, like gunner and medic, served as an integral part of the ship and worked effortlessly for the crew on-board. Having spoken to a few navy personnel, food served as a motivation, something to look forward to, when they are out at sea. Even the dining area, which resembles the interior of MacDonald's with bright plastic chairs and tables, are specially designed to motivate them. Moreover, since fresh and certain ingredients are scarce in other countries, preservation techniques ensure that fresh ingredients will still be available, even after a few weeks off embarkation. The galley is opened to public for the first time, and we got to experience the working conditions of the naval chefs as well. Unlike the kitchen in smaller ships and submarines (as Wisley had described), Endurance's galley is one of the best to work in, says Chef Jagen. The luxury of space allows sufficient walking space, utilities-wise, the ship is equipped to tackle and minimise rough sea conditions, like magnetic shelves, railings and specialised cooking utensils and cutleries. 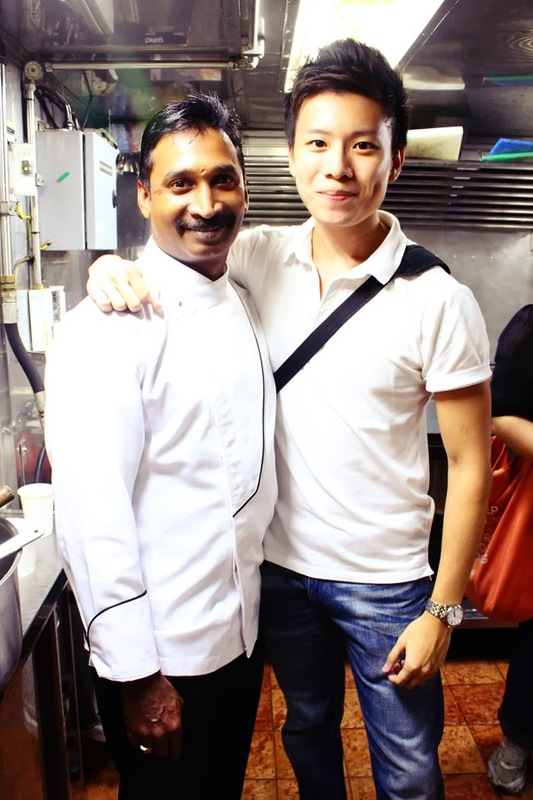 "I believe that a Naval Chef faces more challenges that a hotel chef working in a stable environment. For example, we have to cook while the ship is out sailing in the seas, and we also have to work under pressure and meet our expectations on time. 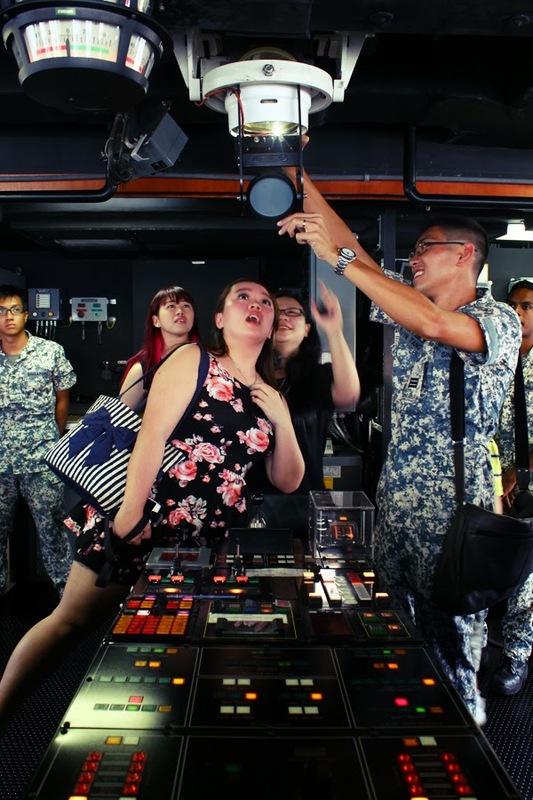 For me, I relish these challenges and enjoy the unique experience cooking on board a military ship." 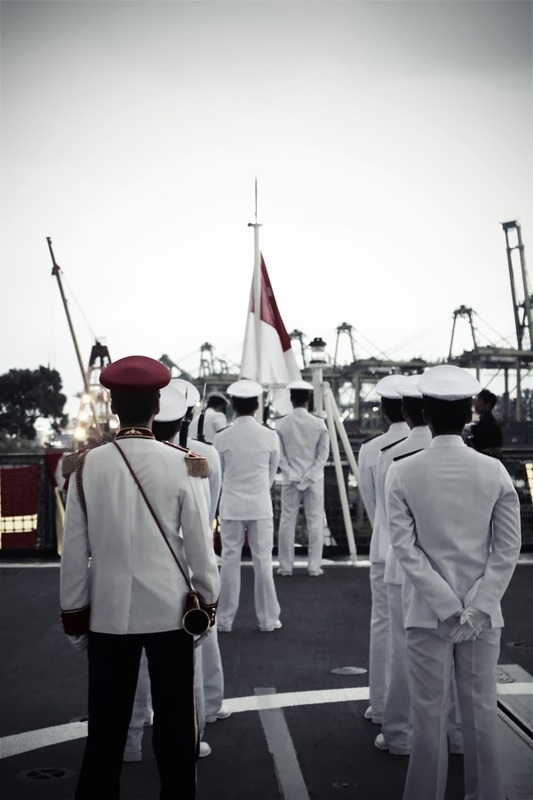 One of the highlights - The Sunset Ceremony is one of the oldest naval traditions, dating back to centuries ago. 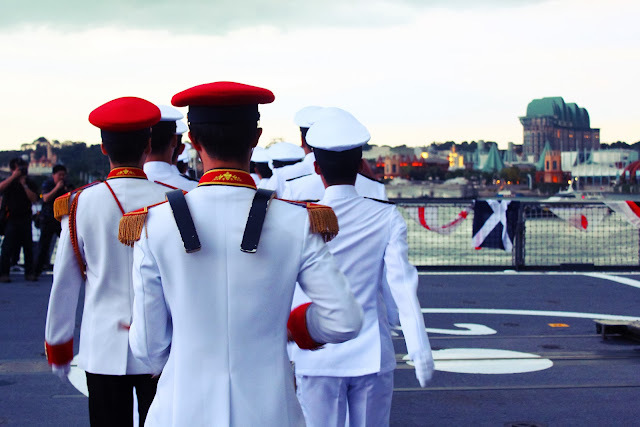 This is practised by navies worldwide, where they salute the lowering of the Ensign during sunset on ships (usually around 6.45 pm). 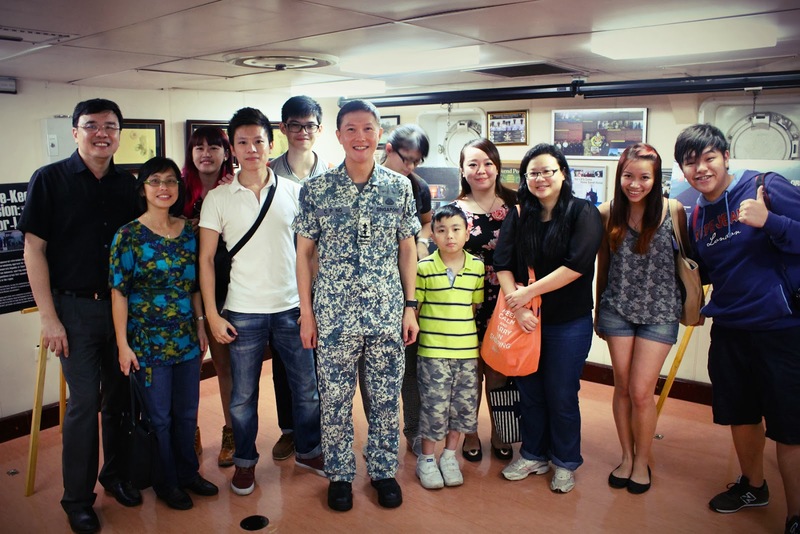 Rear Admiral Ng Chee Peng even graced us with a few talks and a mini photo session. I mean, how often can you take a photo with a two-starred general? Once again, I would like to thank you the kind people in the Singapore Navy for inviting me to this exclusive event, especially our friendly companions during the whole tour. It is definitely an eye-opener, experiencing what I would most likely not be able to, such as stirring fried rice with a shovel-like spatula and, sitting on the commander's seat at the Bridge. Do come down to NAVY @ Vivo, which is happening right now, from 14 to 17 November 2013. 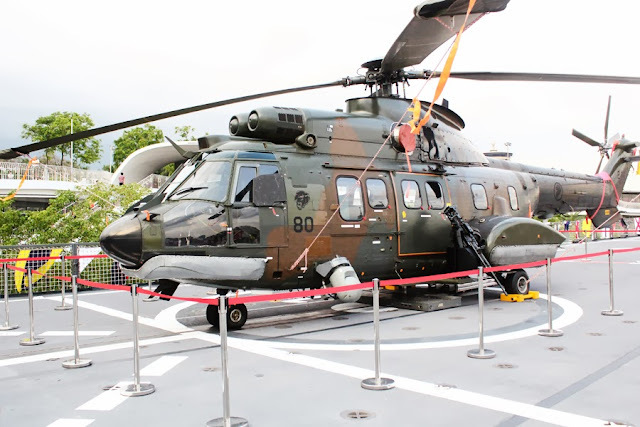 In addition, an exhibition will be happening within Vivocity to showcase the RSN's missions and operations.